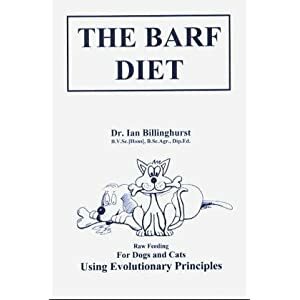 ISBN: 0958592519This book contains a comprehensive description of the principals and practice of feeding a nature BARF diet and is suitable both for the beginner and the experienced BARF feeder. It seeks to answer readers’ questions and concerns as well as containing useful recipes for producing the BARF diet at home. ISBN: 1577790154This is a serious nutrition book written by a well respected veterinary surgeon. I once borrowed my cousin’s copy and found it fascinating. The book covers everything from reading your dog food labels to formulating special diets for specific diseases such as cancer and diabetes.